Muslims appear in New Zealand census from 1874. The Muslim Community in NZ are increasing day by day.. According to Mr. Ayyub Bhikoo, in 1907 Mr. Ismail Bhikoo the first Indian Muslim came to New Zealand. Later in 1930's Mr. Ismail Bhikoo's five sons came to New Zealand. In 1952 First Eid salah was performed in Mr.Suleman Bhikoo's house. In 1950's Mr.Suleman Bhikoo along with 15 other muslims formed the New Zealand Muslim Association in Auckland. Some among the 15 members are Mr.Ghulam Muhiddeen, Mr. Dosi Mia Ali Moses, Mr. Ismail Moses, Abdul Rahim Sukumia, Yusuf Ismail Bhikoo and Mr. Adulsamad Bhikoo. In the same year Islamic Centre in Hargrave Street was purchased. Apart from Muslims from Fiji there was also brothers from Albania, Bosnia and Kosova who had made important contributions during the 1950s and 1960s. In 1960 they called the first Alim Maulana Ahmad Saeed Patel to New Zealand and later they purchased a new Islamic Markaz in Pompeliar Terrace Ponsonby and the sold the Hargrave St. In 1966 International Muslim Association of New Zealand (IMAN) was formed in Wellington. In 1979 IMAN and New Zealand Muslim Association of Auckland constituted as Federation of Islamic Associations of New Zealand (FIANZ). The muslims are immigrants from all over the world and some are local kiwi's as well. Muslims have 2 Festivals known as Eid ul Fitr and Eid ul Adha. Nearing the Eid there is market held in Auckland where we can get prayer mats, dates, Islamic dresses, scarves, food, toys and many more things which facilitates buying for Muslims. This Eid Market is organised by the Almanar Trust. Since1999 the Eid Salat for both the festivals are organised in the parks of Auckland where there were facilities for women and children. The Islamic centers provide facility for Daily prayers, Quran classes and hifz as well. Ijtima, Qirath competitions and various other activities are organised in the Islamic Centers. 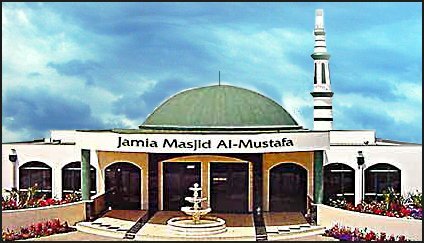 Women's Islamic Confrence was organised from 9th April 1999 to 11th April 1999 at the Hamilton Masjid. In Auckland Dawah courses are conducted by Auckland Islamic Resource Centre. If intrested one can contact at the centre or email them. AS FAR AS I KNOW THE PRAYERS ARE CONDUCTED AT THE MOSQUES BELOW TO CHECK FOR OTHER CENTRES PLEASE CONTACT THE CENTRE. Auckland Islamic Resource Centre (Islamic Dawah & Converts Association of New Zealand), 14, Valonia St., Mt. Roskill. Auckland University Islamic Society, Auckland University Students Association, Princess St., Auckland City. Al-Manar Trust, PO Box 27221, Mt. Roskill, Auckland. Phone 09 626 4172 NZ Muslim Youth & Sports Association, PO Box 22396, Otahuhu, Auckland. International Muslim Association of New Zealand - Wellington Islamic Centre, 42, Daniel St., Newtown, Wellington. Phone 04 389 4725 Lower Hutt Islamic Centre, 12 Hunter St., Naenae, Lower Hutt, Wellington. Amana Corporation Limited - Halal Meat & Food Management, PO Box 1415, Welligton. Phone: 04 384 7526 Al-Hijrah Education Trust - Newlands Islamic Centre, Newlands, Wellington. Islamic Associaton of Wanganui, 68, Talbot St., Wanganui East. Tauranga Muslim Association, 13A, Te Ngaio Road, Mt. Maunganui. Otago Muslim Associaton - Dunedin Islamic Center, 117, Stafford St., Dunedin. Phone 03 477 2521 Muslim Association of Canterbury - Christchurch Mosque, 101, Deans Ave, Riccarton, Christchurch, Phone 03 348 3930.